Alan Weiss’s Sentient Strategy® is a revolutionary approach to the traditional, hidebound, lengthy, and esoteric discussions that take weeks to produce a strategy that is obsolete as soon as a consensus is finally reached. Strategy has to be organic—that is, a pragmatic, living framework within which all decisions are made consistent with the nature and direction of the business. The Sentient approach is meant to formulate strategy quickly, to be used immediately for as long as conditions warrant, and then to make changes rapidly as conditions change. Taking six weeks to create a five-year strategy in these times is like deciding to write longhand in general ledgers to track financial results in a business. 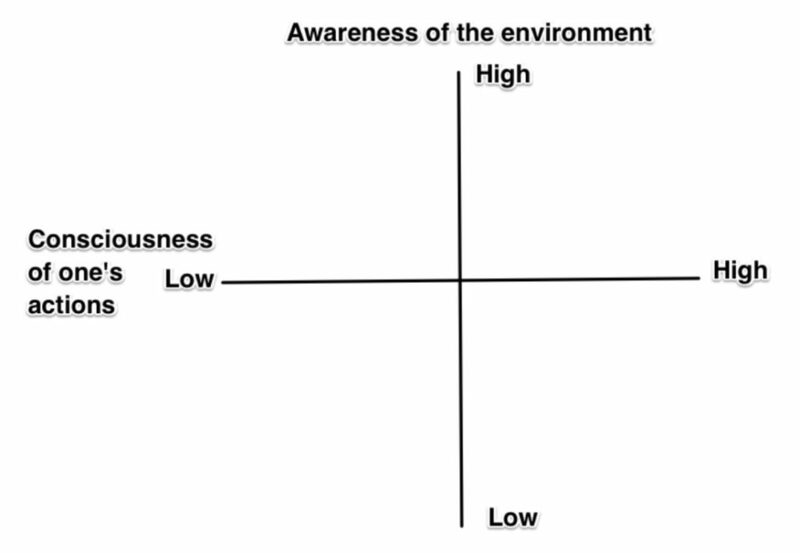 Awareness of the environment: How well do you (the enterprise) view and understand the environment in which you now operate and will operate? Consciousness of available actions: How well informed are you of the gamut of actions available to you that are appropriate and effective? In the chart above, we can see the possible combinations of the two elements. Take a moment to think of organizations you would put in each quadrant. See below for my nominees. Upper Right: A strong understanding of the environment and a high level of consciousness about possible actions. I’d put Jet Blue and Emirates in here, along with Amazon, Apple, and EMTs. Emergency medical people (first responders) save lives by quickly understanding their immediate environment and being acute aware of, and expert in, the actions required under those conditons. Bottom Right: High consciousness but low sensitivity to the environment. Here I’d place all the award shows (Oscars, Emmys, Tonys, etc.) because they are self-congratulatory attempts to recognize peer-level talent, but miss completely the appearance of the wealthy and smug (which is why all of their ratings are plummeting each year). I’d put most Airlines here—for example, United has created all-business class in the front of the plane (Polaris) but eliminated first class entirely, missing out on the growing demand and high profits of the most affluent travelers. Finally, I think the Democratic Party belongs here, because it possesses a very high social consciousness at every level but was tone deaf to the election environment, losing the last presidential election because they believed no one would vote for Donald Trump despite the flaws of their own candidate. Upper Left: Low consciousness and high awareness. I’d place the Republicans here, because they seem very aware of their base and strengths and have great appeal to certain demographics. But they seem completely unconscious about the repercussion of many of their actions and inactions, and the effects on society. I’d place Tesla here, banking on the reaction to environmental-saving power yet oblivious to their failed promises, poor quality, and lack of delivery. Über is also here, delivering a strong service that people have long desired, but rife with sexual harassment claims, poor hiring practices, and poor treatment of employees. Cable companies are here, hooking homes up to great potential, but continually failing to meet customer expectations for service and repairs. Finally, most police forces would be here, very sensitive to their roles in the community (preserve, protect, professionalism, etc., written on the sides of the patrol cars) yet filled with politics, a rigid hierarchy, strong unions, and too often an abuse of power. Bottom Left: Low in both dimensions. I think the postal service, Sears, and multi-level marketing scams are all examples of entities that aren’t well attuned to their environments and their needs, nor sufficiently conscious of their actions and lack of action. The postal service is filled with labor-management law suits and can’t compete with FedEx or UPS; Sears failed to compete with modern retailers and online competition, even though it was once innovative. This is why Sears didn’t morph into Amazon, for example. And multi-level, networking scams (Ponzi Schemes) are simply designed to enrich the originators until the local population is exhausted, despite the fact that people who enter after the initial offering never make the promised money and simply add to the founders’ wealth. The framework we’ve created using Sentient Strategy® principles involves the major elements of an organizations (which can be changed depending on each environment) to move from today to the desired future state. People don’t fear the future, they fear the journey to the future. This framework creates a safe and clear journey and therefore accelerates speed toward an improved tomorrow. Our experience is that this is best done at least quarterly. 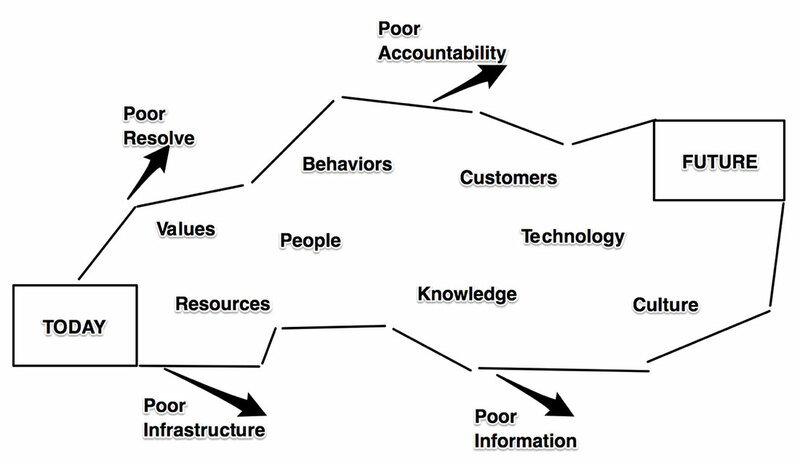 Note the examples of faulty actions (e.g., poor accountability) that drive organizations outside of the successful framework. I’ve decided to train people to market and implement Sentient Strategy®. There is no license, no annual fee, no royalty; there is merely a certification and training fee. If you choose to be certified to formulate and implement Sentient Strategy® it is yours forever, only requiring my trademark to be used with it. For information in being certified in our two-day program, please contact me: alan@summitconsulting.com.